Figure 1: Severe wear of the lower front teeth. Despite the damage to these teeth, this patient was fortunate. He exhibited no TMJ symptoms, no cracked teeth, and no significant soft tissue problems. To slow the wear, tooth-colored fillings were placed as shown in Figure 2. Earlier intervention would generally be recommended. 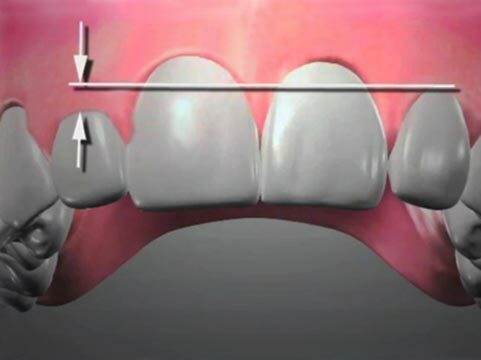 Attrition is the term used to describe wear on the biting surfaces of natural teeth and dental restorations. The wear itself is a diagnosis that can be treated, but it’s also a symptom of a larger problem which, if overlooked, can result in the failure of restorations performed to fix the wear. Common causes of attrition include tooth grinding (bruxism) and inappropriate alignment of the teeth (like gears that don’t mesh properly), a condition known as malocclusion. An attempt should be made to address the source of the bruxing if present (e.g. emotional stress, etc. ), which may involve medical intervention as well. If the bruxing habit cannot be eliminated, it should also be treated. Orthodontics should be considered if improper tooth alignment is noted. 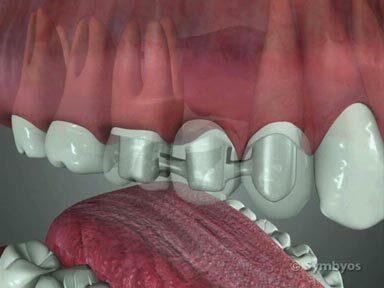 In the case of severe malocclusion, maxillofacial surgery (orthognathic surgery) may be recommended. Severe attrition like that shown in Figure 1 can be a serious problem. If all the teeth are involved, the jaws may rotate together more than they should. This is known as loss of vertical dimension of occlusion (bite collapse). Figure 2: Tooth-colored composite resin fillings placed to decelerate the wear on this patient’s teeth had delivered several years of trouble-free service at the time of the photograph. Limited treatment such as this may not be successful in a patient with an ongoing tooth grinding (bruxing) problem, and additional or alternative care may be needed. Bite collapse can result in damage to the jaw joints; severe pain or dysfunction in the jaw joints (TMJ dysfunction); excessive muscle contraction forces as the closing muscles of the jaw shorten (which can accelerate the destruction); cracked or chipped teeth; aggravation of periodontal disease (secondary occlusal trauma); shortening of the lower face height (which changes one’s appearance); an inverted smile (corners of the mouth sag); frequent cracking or chapping at the corners of the mouth (angular cheilitis); and problems chewing. Despite the obvious severe wear on the teeth, the patient in Figure 1 exhibited none of these conditions, as the back teeth had been crowned and prevented the bite from collapsing. 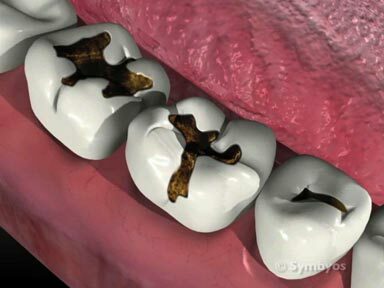 If wear happens slowly enough, the teeth may continue erupting (moving into the mouth further) as the wear occurs, which can minimize or prevent bite collapse (and make fixing the problem more difficult, since there may be little or no room to add tooth structure). If the patient has periodontal disease, in which the tooth supporting bone is softened by the disease, some teeth may be lost, while others tip outward from the increased chewing forces applied to them. This can also lead to bite collapse, whether or not the teeth themselves become worn. How does the dentist diagnose Attrition? Tooth enamel is the hardest substance in the body. It is very durable, and under normal conditions wears very little over a normal lifetime. It is becoming more common to see elderly patients with a complete set of natural teeth, that exhibit little if any visible wear. Diagnosing attrition is easy, and amounts simply to observing visible wear planes (facets) on the teeth. What is less straightforward is determining whether the attrition is part of a larger problem (e.g. an ongoing bruxing habit, or malocclusion). If so, the attrition will likely get worse, and any treatment prescribed to repair the worn areas of the teeth may not hold up well over time unless the underlying cause is also successfully treated. It is important to determine how long it took for the wear to occur. In general, excessive wear is a bigger problem on a younger patient because it has occurred in a shorter time frame, and the patient’s life expectancy would normally be greater. Which teeth are involved also needs to be considered, so that the cause(s) can be identified and the most appropriate treatment(s) performed. Treatment options for severe attrition and bite collapse can be very costly, as it is sometimes necessary to place crowns or other types of dental restorations on several teeth to re-establish the proper vertical dimension of occlusion (the position the jaws are in relative to one another when the teeth are closed together fully). If bruxing is suspected, your dentist may recommend bruxing appliances (also known as occlusal guards, night guards or bite splints) to help reduce stress and wear on the teeth. There are several types of occlusal guards, and they may also control chewing muscle forces, and forces applied to the temporomandibular joints (TMJs). In some cases tooth colored filling material bonded to the teeth may accomplish the same objectives as an occlusal guard, but crowns or onlays may be the only long term solution in severe cases of attrition. Often, it is appropriate for the patient to use an occlusal guard after the teeth have been restored, to protect the new dental restorations. Whether or not attrition should be treated depends on several factors, including the age of the patient; the amount of tooth structure that has been worn away; and the length of time over which the wear occurred. Wear on primary teeth (baby teeth) generally doesn’t require treatment unless there is no permanent tooth in the jaw to eventually replace it, or the wear has contributed to decay (in which case restoring the cavities will usually solve the problem until the the teeth are lost naturally). Wear into the dentin of a permanent tooth on a person in their teens or twenties is severe, no matter how long it took. Wear that is just beginning to enter the dentin on an 80 year-old woman is relatively less serious. Only your dentist can tell you for sure whether, and how, the attrition should be treated. Sometimes the dentist will take photographs showing the extent of the wear, and monitor a particular landmark (e.g. the tip of a canine tooth) at checkups. Stone casts of the teeth may also be used. If treatment is recommended, it will probably involve one or more of the following options: crowns; inlays; equilibration (adjusting the way teeth fit together); fillings; core buildups; occlusal guards; onlays; orthodontic treatment. Other treatment may be recommended.